The seminar, entitled Michelle Talks Personal Finance, will explain personal finance principles such as budgeting basics, conquering debt, basic investing, saving for the future and stewardship. Persons interested in attending may register on the Credit Union’s website at andrewsfcu.org/seminars. Michelle Singletary is a nationally syndicated columnist for The Washington Post, where she writes the award-winning column, "The Color of Money." 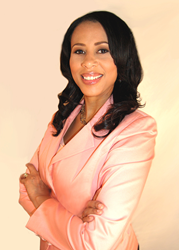 In her spare time, Singletary is the director of “Prosperity Partners Ministry,” a program she founded at her church in which women and men, who handle their money well, volunteer to mentor others who are having financial challenges. Andrews Federal Credit Union was founded in 1948 to serve the needs of military and civilian personnel by providing a vast array of financial products and services. With over $1 billion in assets, Andrews Federal has grown to serve more than 113,000 members in the District of Columbia, Joint Base Andrews (MD), Springfield, Virginia (VA), Joint Base McGuire-Dix-Lakehurst (NJ), and military installations in central Germany, Belgium, and the Netherlands. In addition, the Credit Union serves as a financial partner with many select employee groups in Maryland, the District of Columbia, Virginia and New Jersey.